Women going through menopause are at a higher risk of developing an anxiety disorder and may wonder what they can add into their diets for natural relief. Almonds may be the answer. 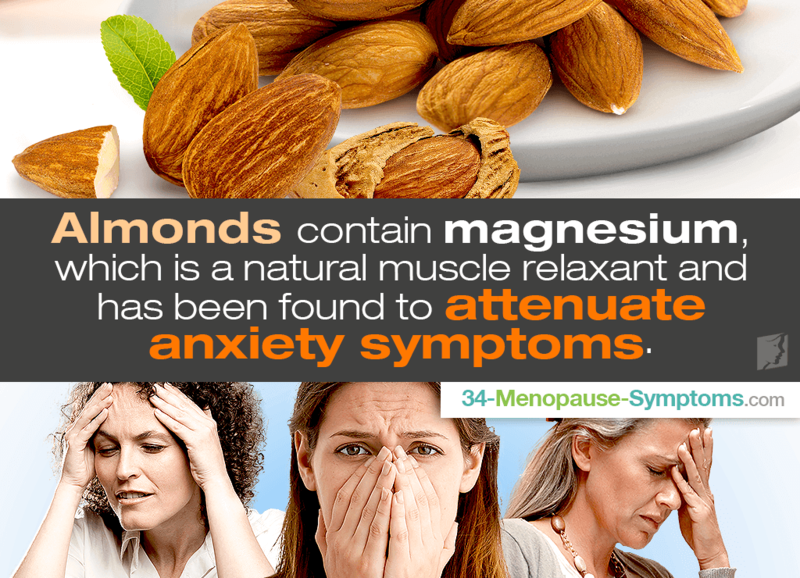 Continue reading to learn about how almonds can help overcome anxiety during menopause so that you can stop worrying and start living. Almonds are good for anxiety because they are rich in vitamins, minerals, and other nutrients necessary to relieve stress during menopause and other periods of reproductive significance. Also, along with improving mental health, almonds have also been found to boost heart health and memory while decreasing the risk of Alzheimer's. Almonds are rich in an amino acid called tyrosine. Tyrosine is essential for the body to produce neurotransmitters, which are a class of chemicals that include dopamine. Neurotransmitters are responsible for helping cells in the nervous system to communicate and also influence mood. Research has shown that zinc can be used to fight mental health problems and depression because it plays an important role in how the brain and body respond to stress. Low levels of the mineral are also correlated to depression, Attention Deficit Hyperactivity Disorder (ADHD), and aggression. Almonds contain vitamin E, a powerful antioxidant that protects cells from oxidative damage. Research has found that those suffering from generalized anxiety disorder and depression have significantly lower levels of vitamin E compared to others. Magnesium is a natural muscle relaxant and has been found to attenuate anxiety symptoms by moderating the activity of the hypothalamic pituitary adrenal axis (HPAA), which copes with the demands of stressors. Almonds - like other nuts, tomatoes, fruits, leafy greens, fatty fish, and olive oil - contain healthy fats. These healthy fats fight inflammation, and inflammation can lead to heart disease, diabetes, and mental health problems like anxiety. While a healthy, well-balanced diet that includes almonds can help improve mood, menopausal women suffering from anxiety should look to treat the underlying cause of hormonal imbalance for optimal results. Click on the following link for more information about natural and effective anxiety treatments.